Prosciutto might look like thinly sliced deli ham, but it has a much bolder flavor that's part smoky, part tangy and part salty. The meat is often added to pizza or wrapped around fruits or vegetables, and that's fine every once in a while. You don't want to eat prosciutto on a regular basis, because it's high in fat and sodium, but it does supply certain nutrients, as well. Prosciutto is high in fat and sodium and may not make the healthiest addition to your daily diet. An ounce of the average commercially purchased prosciutto contains between 3 and 3.5 grams of fat, of which about 1 gram is saturated. That translates to about 5 or 6 percent of your daily saturated fat limit. Limiting your intake of saturated fat is a smart way to protect the health of your heart and reduce your risk of high cholesterol. That same ounce of prosciutto also supplies 8 or 9 grams of protein, a nutrient essential for survival, and from 10 to 25 milligrams of cholesterol. A major drawback to eating prosciutto is the amount of sodium it contains. One ounce of the average store-bought prosciutto has between 570 and 660 milligrams of sodium. That's between 25 and 29 percent of your daily 2,300-milligram sodium limit. Regularly eating large doses of sodium can raise your blood pressure, which puts you at an increased risk for heart attack and stroke. If you already have high blood pressure or heart problems, you should consume just 1,500 milligrams of sodium per day, the University of Maryland Medical Center advises. Despite the saturated fat and sodium content of prosciutto, you still get certain key nutrients, though in small amounts. An ounce of the average store-bought prosciutto supplies 2 percent of the iron you need each day. Iron helps maintain your energy supply by transporting oxygen to all the cells in your body. The mineral also plays a role in the formation of red blood cells. Prosciutto also supplies trace amounts of zinc, niacin and vitamin B-12. 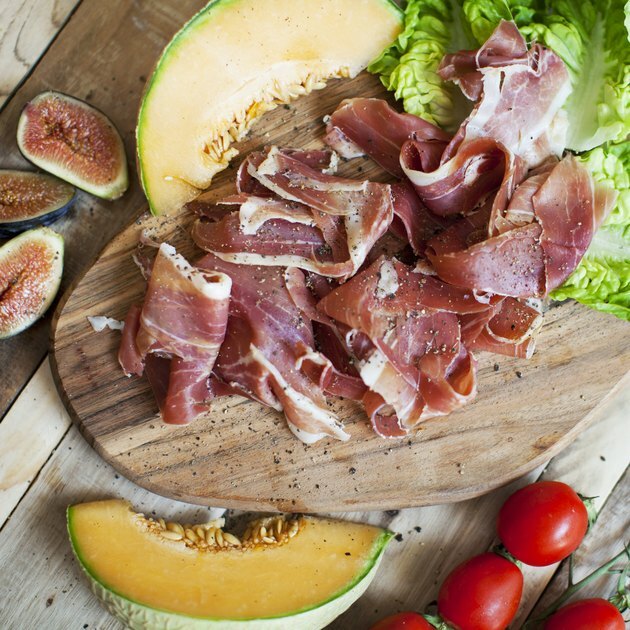 While the occasional serving of prosciutto won't wreck your healthy eating plan, you should think twice before eating it on a regular basis. In addition to the saturated fat and sodium you consume, you'll also be eating the chemicals used to process the meat. Researchers at the Harvard School of Public Health found that eating processed meats puts you at a 42 percent higher risk for heart disease and a 19 percent higher risk for Type 2 diabetes. Results of the study, which was based on a review of about 1,600 studies, were published in June 2010 in the journal "Circulation." The nitrates and nitrites in processed meats might increase your risk for certain types of cancer, as well. The researchers also noted that higher consumption of total meat and processed meat can increase the risk of colorectal cancer. But they pointed out that unprocessed red meat has not been studied separately as a cause of colorectal cancer. Does Eating Pork Cause High Blood Pressure?